The record is made up of 2 folios. It was created in 26 Jun 1852. It was written in English. The original is part of the British Library: India Office The department of the British Government to which the Government of India reported between 1858 and 1947. The successor to the Court of Directors. Records and Private Papers. 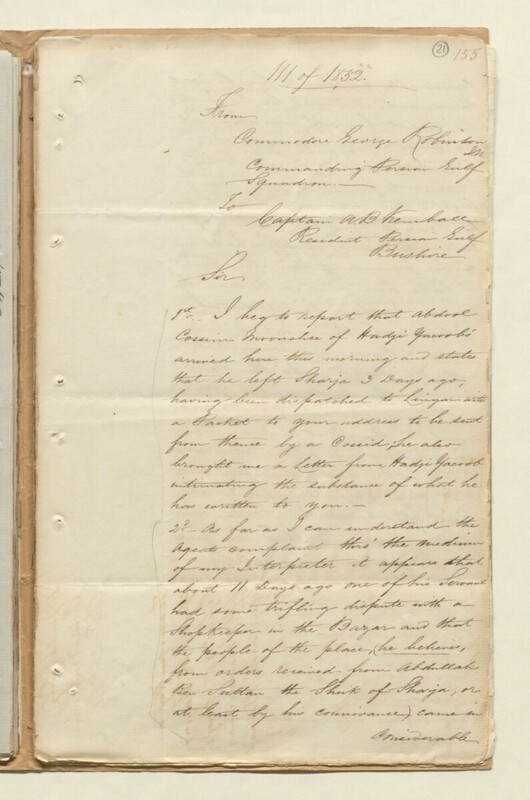 In this letter Commodore George Robinson, Commander of the Persian Gulf Historically used by the British to refer to the sea area between the Arabian Peninsula and Iran. Often referred to as The Gulf or the Arabian Gulf. Squadron, informs Arnold Burrowes Kemball, Resident in the Persian Gulf Historically used by the British to refer to the sea area between the Arabian Peninsula and Iran. Often referred to as The Gulf or the Arabian Gulf. , of the arrival of Abdool Cossim, a moonshee [ munshi A secretary or political assistant working in the British administration in the Gulf, often also providing linguistic interpretation. ] sent by the Agent at Sharja [Sharjah], Hadji Yacoob. Robinson states that the moonshee brought a letter (see ff 9-10 of this volume) from the Agent which intimated the contents of a letter addressed to Kemball. Robinson relays a complaint from the Agent regarding the harassment of his servants, reportedly on the orders of the Sheikh of Sharja, Abdullah Ben Sultan [Abdullah bin Sulṭān, Governor of Sharjah], following a dispute at the bazar [bazaar]. Robinson goes on to recount other information provided by the Agent's moonshee. According to the moonshee, the Centaur was plundered at Ras-el-Had [Ḥadd, Ra's al] by a Buggarah belonging to Ras-el-Khymeh [Ra's al-Khaymah], which was carrying slaves from Zanzibar. Robinson reports that the Agent has stated that several hundred slaves have been brought from Zanzibar this season.